Now that Labor Day has passed, I'm on the mission to build up my fall wardrobe. This is my favorite time of year to shop, and while I'm looking to add a few trendy pieces to my closet, I also like to invest in a classic coat or sweater that will last me many seasons to come. This Andrew Marc suede jacket is on the top of my list. I recently posted about the brand here, and think this jacket would be a great staple in my wardrobe. I'm still crazy about the lace up trend, and love the idea of a lace up sweater. This Endless Rose option is not only stylish, but looks like it would be cozy on a cold winter day. Velvet is huge this fall, especially in the color navy, and I'm totally smitten over these Steve Madden boots. I've been on the hunt for a new tote, and am obsessed with this color block Sole Society option, not to mention, I love the price! And of course, my fall wardrobe would be complete without a new pair of jeans and sunglasses. I love the fringe hem on these jeans (how great will they look with the velvet boots? ), and how cool are these Marc Jacobs sunnies? What are some of the items on your fall wish list? Absolutely loving the suede jacket! Lovely post. Just love the Fall Collection! Those boots are the best! I love everything!! How amazing is that lace-up top? The Jacket? THOSE VELVET BOOTS!?!?! 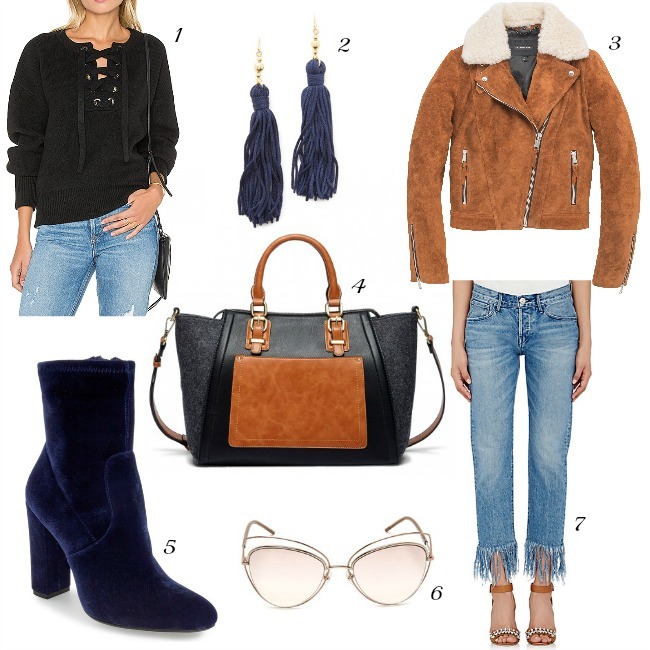 I seriously want and love everything on this list, especially the jacket, bag (looks so expensive) booties and sweatshirt. Amazing picks. Hope you get them all!